The original company was established by a Mr Stafford, in Higham Ferrers in 1870, working as a service engineer for local tanneries, and also making large wooden tanning drums. In 1928 the firm was taken under the control of Cyril Norris and established a wide range of tanning and finishing equipment. "Norris Industires" also had a world-wide reputation for the quality of their re-built machines. In 1962 Mr Norris sold the company to John White Footwear Holdings, and as some of the traditional air driers were being replaced by gas heated processing machines, so the company diversified into other specialised machinery. They held agencies for regional distribution of electrical components for GEC Electric Motors, Dewrance Valves, Mono Pumps, Cutler Hammer Control Systems, and Opperman Gears. They were also making specialised test boards for a number of Electricity Boards in the United Kingdom. In 1967 Cyril Norris retired and Walter Landmann took over running the company. This also saw the acquisition of Universal Industrial Appliances (UIA), makers of industrial floor cleaners, and vaccuum cleaners. New premises were built in Irchester Road, Rushden, in anticipation of further growth after they acquired Sterling Industries Kent Panda Cleaning Machines, and was now called UIA Panda Division. Private company, Registered September 5th. Capital: £5,000 in 5,000 shares of £1 each. Objects: To carry on the business of engineers, contractors, mill furnishers, manufacturers of and dealers in engineering and mill specialities, leather currying and other machinery and curriers’ and tanners’ drums, etc. The directors are: Cyril Norris, Bolton House, Kimbolton Road, Rushden, engineer (permanent). Donald Norris, Bolton House, Kimbolton-road, Rushden, engineer. Norris & Son - Previously owned Safford, Wellingborough Road. 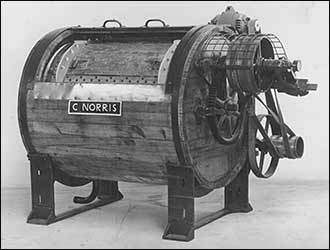 Norris' began in a small way making machines for the Leather Industry. 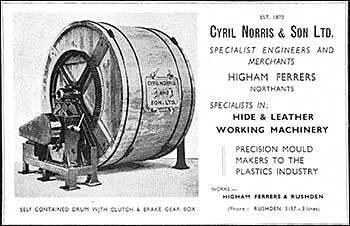 I think I am right in stating that Norris' were the first firm to fit a gearbox to a leather drum instead of it being driven from line shafting. At the outbreak of the 1939 war Norris' were commissioned to recondition lathes from A. Herbert's of Coventry; this was a totally different job from currying machines. At the end of the war a partner joined the firm - Mr. J. Orme and all the dies etc. were made for the Rosebud Doll factory at Raunds. Mr. Orme then left to start on his own taking a number of skilled men with him and made machines for the plastic industry. Mr. G. Longland, Mr. R. Walker, and Mr. E. Houghton. Their work consisted mainly of cones for road works and anything connected with the plastic industry. 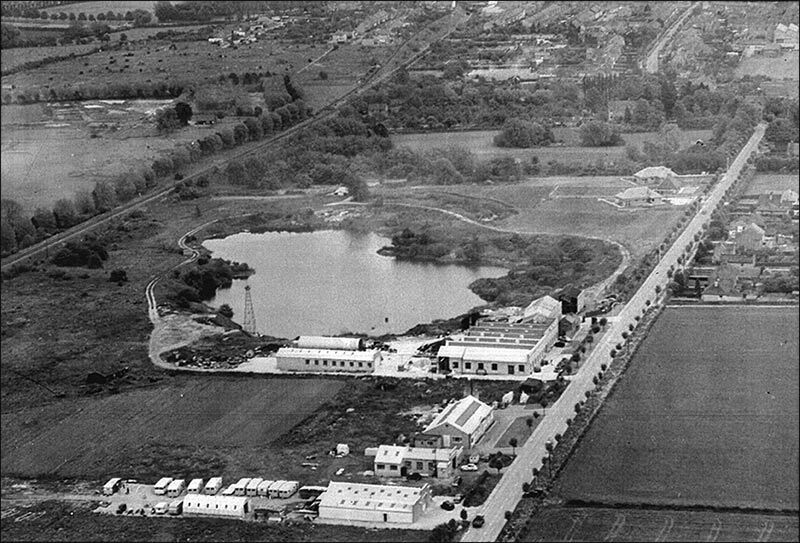 They still have a factory in Duck Street and one in Park Road. I think that Smiths Containers Ltd was started from these factories.